Disney has probably the widest variety of dining options in one location. Looking at all of their options can be a bit overwhelming. Not only do you have quick service and snack locations, but you also have table service, traditional buffet, family style buffet, and character meals. You also have signature restaurants vs. standard restaurants. To make matters more complicated you can make your advanced dining reservation, or as they are commonly called ADRs, up to 180 days prior to the date requested. This means that in order to guarantee your dining experience of choice you need to think ahead. If you are staying on Disney property you can make your ADR’s all at one time exactly 180 days prior to your arrival date (with a maximum of 10 days before your dining reservation date). However, if you are trying to make an ADR for an extremely popular restaurant, for example Cindarella’s Royal Table, and if they tell you that there is no availability call back on the actual 180 day mark because not all of the tables are allowed to be filled with the 180 + 10 days perk. 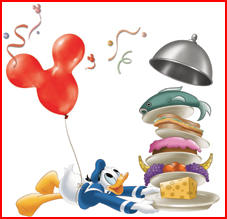 Disney has implemented the Dining Plan (DDP) for all guests staying on property. There are options that allow for a personalized experience for all types of Disney visitors. There are 3 dinning plans, that can suite different price ranges. **Be aware that prices do not include gratuity. Quick Service Dining Plan: This plan is the cheapest and includes 2 quick-service meals and 2 snacks per person per night of your stay. You’ll also receive a mug you can refill with the beverage of your choice, as often as you like at any quick-service restaurant at your Disney Resort hotel. Standard Dining Plan: This plan is the most popular and includes one Quick-Service Meal, one Snack, and one Table-Service Meal per person, per night of your stay. Deluxe Dining Plan: Being the most expensive it includes three Meals and two Snacks per person, per night of your stay. The three meals in the deluxe dinning package can be used at quick service or table service locations. A future blog will go over the math involved with saving money on the dinning plan. I cannot stress the importance of advanced dinning reservations (ADRs). If you want to be able to enjoy the better restaurants at prime meal times you MUST have ADRs. If you are traveling during the summer or around the holidays you will need to be on the phone at exactly 7:00 am 180 days out if there is a restaurant experience you cannot live without. In our family it is always fun to make the dining decisions. There are places that are musts on everyone’s list. You can never please everyone but planning and deciding is half the fun. So browse your options, read reviews and plan ahead. When Disney implemented the dining plan, ADR’s quickly became a must have, so do not be left with quick service or a 9pm dinner reservation as your only option if you purchased the Standard Plan. As a quick side note, there are specials running for this summer and into the fall with a free dining plan option. Keep your eyes peeled for these promos. It is a great way to save a bundle of money!